The dark horse of the fruit beer series — in terms of colour, if nothing else. The problem with reviewing a really good beer is sometimes all you want to do is yell about the one facet you love. 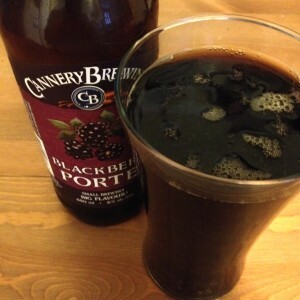 So what’s the thing I love so much about this blackberry porter? Well, no, not literally purple, as you can see in the photo. But there’s no other word for me that better describes the taste. But here purple gets to make up for past sins. This is a beer with a deep, rich purple finish that’s all berry. Like a raspberry beer, the blackberry is quite tart, but I’d say the berry flavour here is more robust than what I’ve experienced with most craft berry beers — in keeping with blackberries themselves, which I’ve always thought of as more of a punch-you-in-the-mouth fruit than their red contemporaries. The berry note here is jammy and round, the way fruit flavour might present in a really good red wine. Purple. It’s a beer that benefits from a slow, considered sipping over conversation, in part because the jam notes will stay distinct even if your palette’s like mine and not that great after the first five tastes. Unlike most of the beers in the fruit beer throwdown, this one doesn’t need a hot summer day and a patio for maximum enjoyment, either. I can see this being very nice at the end of a long day in late October or November, when you’re looking for a gentle reminder of summers past. Posted in Beer. Tagged 650mL, fruit beer throwdown, Penticton. For some reason Frambozen only photographed colour-true on my oven. Go figure. Steamworks, I don’t know if it’s you or me, but this relationship isn’t working. I like so much about you in theory. 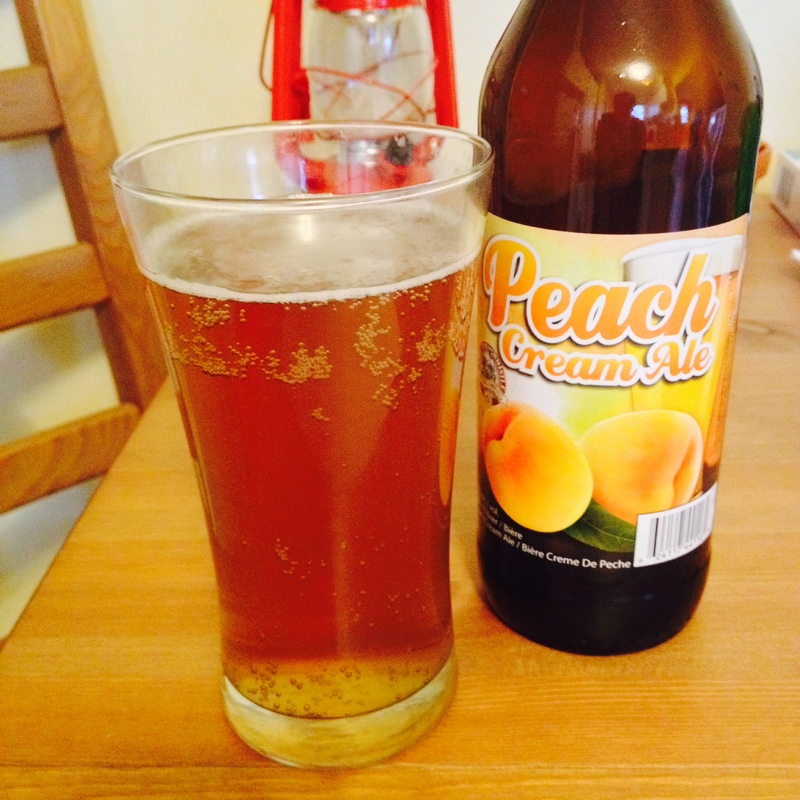 Your beautifully designed bottles, your intriguing and varied seasonal choices, but there’s always something… off. We don’t fit together, Steamworks. It’s not you, it’s me. Unless it’s you. Frambozen, the company’s summer brew, is a pretty good case in point. Raspberry ale is an old standby for me — the first craft brew I ever drank, as a barely-legal 18 year old in Alberta. With its gorgeous gemstone hue and a prominent, but not-overpowering berry scent, and less carbonation than some of the more commercial B.C. breweries (a plus to me — beers that fizz like soda wig me out a little), Frambozen seems like the ideal beer. And it’s not bad. The raspberry is nice and centred in the sip, with a flavour that is recognizably found in nature. The beer is not too sweet, another death trap for berry beers. But, like every Steamworks beer I’ve tried, this one has some odd, overly-assertive notes. While the bitterness up front is fairly pleasant once you’re acclimated to the brew, the tart — no, sour finish of the beer never seems to get less jarring. Even most of the way through the bottle, every sip ended with a jolt to the tastebuds. Though the fruit flavour in Frambozen is far, far superior, I couldn’t help but think of the Sour Puss Raspberry concoctions of my misspent youth, which finished with a similar zing. 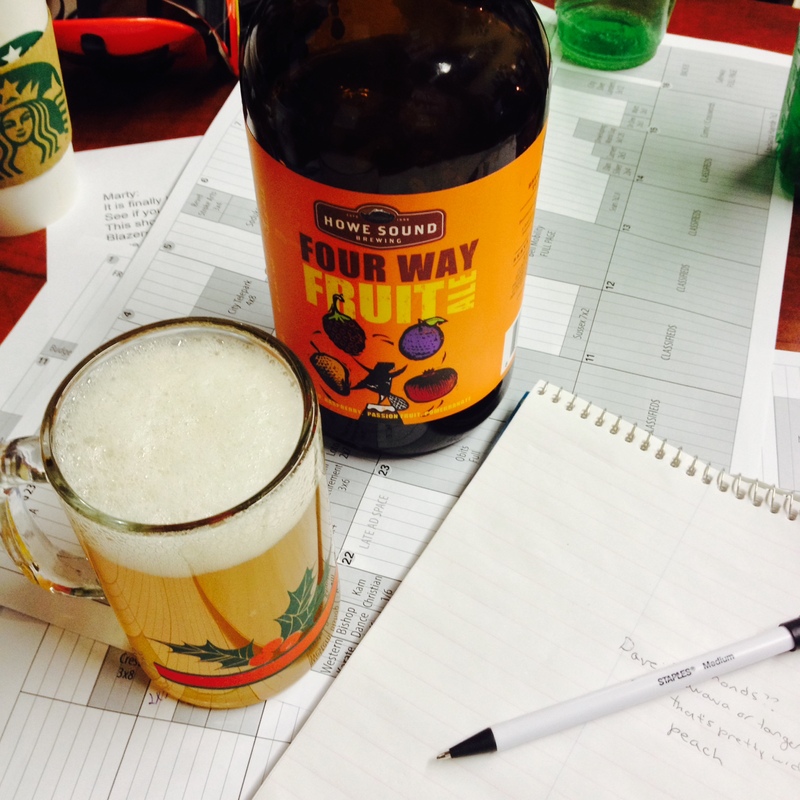 I enjoy a challenging beer… to a point. But 650 mL of strong beer that keeps smacking me in the mouth is too much. This is how I feel about every Steamworks beer, alas, whether it’s bitter notes in the wheat ale or soapy hops in the Pilsner. It’s just not meant to be. 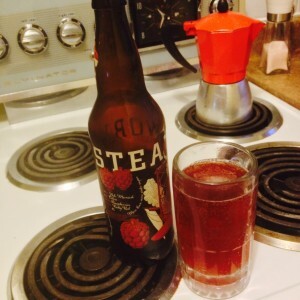 Bottom line: If you like berry beer and want something to wake up your taste buds, this ought to do the trick. As for Steamworks and me, it’s time we tried seeing other people. Posted in Beer. Tagged 650mL, Burnaby, fruit beer throwdown, Steamworks Brewery. What the Heck, What the Huck? Lens flare! The most exciting thing happening in this photograph, alas. Oh, it’s What the Huck, I thought at the liquor store. I’ve been meaning to try that. The first indication this taste test might not be headed in a great direction came about five minutes after returning home, when I discovered an empty What the Huck bottle at the top of my recycling box. I have no memory of drinking this beer, and yet the evidence was there. Amnesia beer. Not a good sign. What the Huck pours slightly pink, which is about as much a concession to its name as I can come up with. 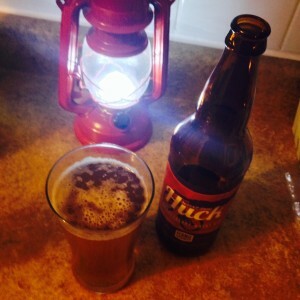 If you stop trying to psyche yourself into tasting berries and just drink the darn pint, What The Huck is basically a sweet but thinner winter ale, with the usual hints of caramel and vanilla. Not bad, but pretty forgettable. Nice to know it’s the beer and not me. Props for the name, though. You saw an opportunity and you seized it, Fernie Brewing Co.
Posted in Beer. Tagged 650mL, Fernie Brewing Co., fruit beer throwdown. 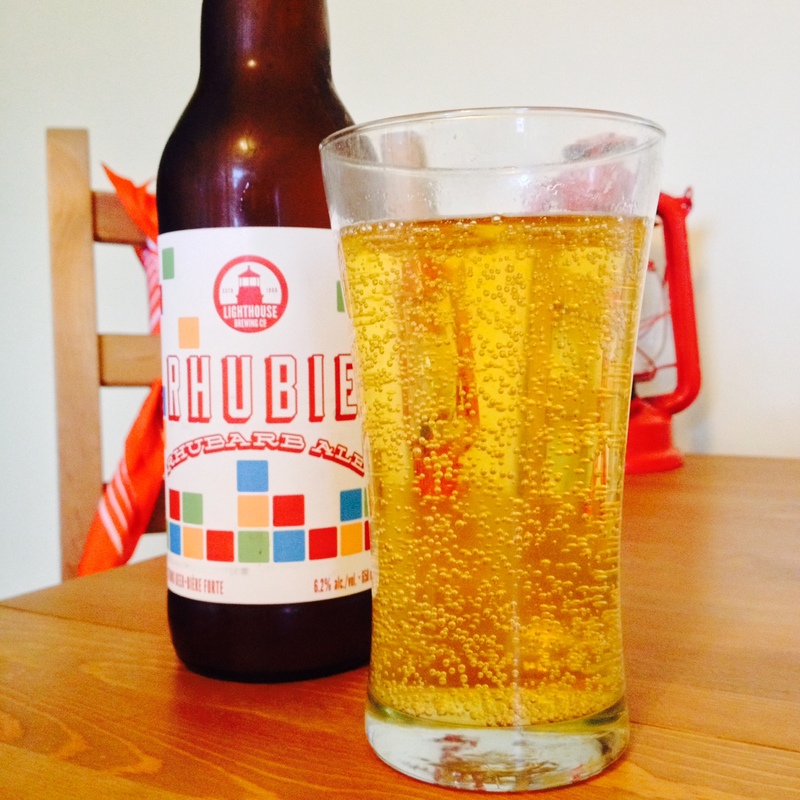 If nothing else, Rhubie wins the cute beer label contest hands down. While I’ve been trying not to prejudge any of the beers I drink for Bad Rider, I didn’t have high hopes for Lighthouse Brewing Co.’s Rhubie, which I’d heard some bloggers complain didn’t taste anything like the fruit it’s supposed to contain. After the whole What the Huck experience I’m wary of fruit beer that seems to sub sugar for flavour. Thankfully that’s not the case here. I think what may make it easy to discount Rhubie’s rhubarb flavour is that rhubarb in its raw, unsweetened, unseasoned form doesn’t appear on a lot of menus. Sure, the internet tells me it’s a thing (in smoothies — of course), I can’t say the idea of eating what amounts to a sour, tough and pink celery knockoff really appeals. Fruit crisp all the way. But that’s the place where the rhubarb flavour in Rhubie is coming from, and here it’s a welcome addition. If you’re looking for it, the rhubarb seems to show up most at the top of a sip as a very green, almost grassy flavour, that gives way to a crisp wheat beer with some Pilsner affectations. It’s not a particularly aggressive fruit profile, and if you’re looking for something on the Peach Cream Ale end of the fruity spectrum you’ll be disappointed. Ditto if you’re picking it up mainly for the novelty factor of hey, rhubarb in beer. But if you’re a wheat ale fan more than a fruit beer fan this is actually a pretty solid pick. Remember that green top note I talked about? It has the benefit of making the beer very, very drinkable. The lighter, tart flavour of the rhubarb seems to break up the sips, making it one of the more refreshing wheat beers I’ve had recently. For only 6.2 per cent ABV, this seemed to have one heck of a kick to it as well, but that might have had something to do with me finishing the bottle in what is now record time for one of these reviews. Posted in Beer. Tagged 650mL, fruit beer throwdown, Lighthouse Brewing Co., Victoria. Normally bright yellow, an iPhone 4s and a dark fan in the background can do mysterious things to the colour of a beer. If there’s one thing to know about my reviewing style up front, before we get this sucker going, it’s this: My ideal beer is Whistler’s Paradise Valley Grapefruit Ale. 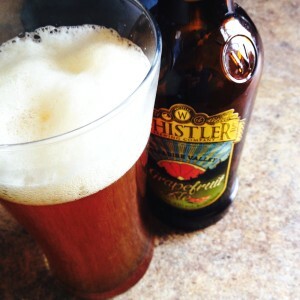 Over the course of the month I’ll have more to say about fruit beers, but in the back of my head I’ll be comparing everything to Whistler’s cult summertime favourite. For those uninitiated, Whistler Grapefruit is, I’m convinced, the beer Anheuser-Busch wants you to believe you’re drinking when you sidle up to the bar for a Corona. Bright yellow in colour, W.G. is similarly smooth while also retaining that bite and snap of citrus right off the top — even without a lime slice shoved down the neck. Of course, I wouldn’t love it the way I do if there weren’t differences. Rather than the high-acid sourness of lemons and limes, W.G. aims for grapefruit’s earthier, bitter notes. Posted in Beer. Tagged fruit beer throwdown, six pack, Whistler Brewing Co..